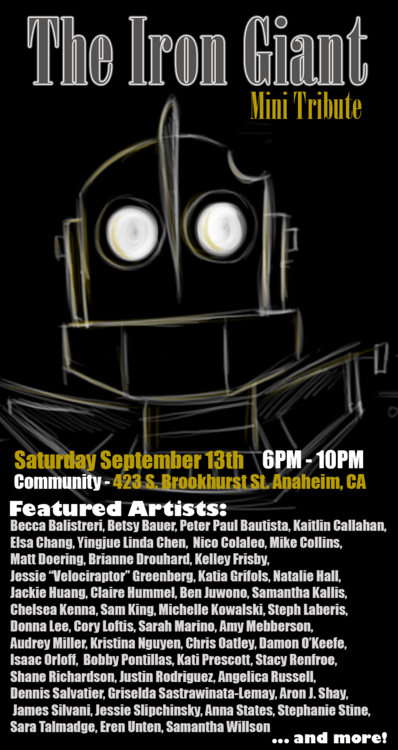 My friend, Jessie is curating an Iron Giant Tribute show! There are a ton of amazing artists from all over making pieces for this show. The background is done with watercolors while the middle ground is made from paper. The foreground, featuring Hogarth is actually etched into the glass! So it has a frosty appearance on the original. No photo can really capture what it looks like - it’s a must see in person kind of piece. The show is for ONE NIGHT ONLY. So if you’re a fan, you must check it out! *UPDATE: In case you missed the one-night-only Iron Giant Tribute show, you can still snag one of the amazing pieces of artwork from it here! Pieces are available until September 30th, 2014.